It’s very easy now to protect your house shop or any other places from robbery, or any kind of vandalism. This fake camera is shaped properly to be used as an alternative to small and highly used security cameras on today’s market. 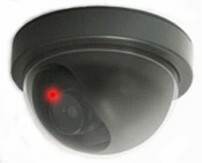 This device bears a red colored LED flashing light to alert anyone they are being watched especially at night. The flashing LED light can be turned on or off by pressing down on the dome until a clicking sound is heard. It is installable very easily and quickly to walls or ceilings with the included screws.